To add to @Bergmeister, familiarity with that route, by comparison the LA road is more "vertical " and about one third the distance than the one to VT so you don't get such a severe climb to VT.
You can see the Hamaeu De Kashmir on Google maps, you can print it out to compare with finding it on a sat nav when you're on route if it helps. @Pejoli, The family bash last Easter was at the Hameau du Kashmir, so quite a few snowHeads will have used their parking. Maybe ask on the thread for that bash. I would expect that you would just go to the check-in for the HdK first. this January I will return to Les 3 Vallees for a week and I am intending to spend most of my time there skiing off-piste. I am looking for reasonably priced (and of course good) offpiste guide for intermediate offpister. I will be stationed in Les Menuires so i guess La Masse will be my theathre of ski . Do you have any recommendation for a really good guide with a lot of patience with intermediate offpister? Rumors that Courchevel will open in the next week or so. @matejp, We had fun with Vincent Suchel a few years ago who you can book through Prosneige in Les Menuires. Instructor plus qualified off piste guide and instructor. How is the snow at Meribel Center in mid March? My family is considering staying there as an alternative to Courchevel 1850 and it's central location. It will be the first time in the 3V. They'll be good snow cover, potentially a bit slushy - no big deal. I would have thought Meribel might be a bit cheaper than 1850. Is that why you are considering it? Or is purely location? A little of both. My sons are in their 20's and more interested in pub style apres ski than high end chic apres ski, if that makes sense. I have a reasonable place to stay at either. I understand the snow quality is better at 1850. And we have one female non-skier. Go to Meribel. Apres in C1850 is non-existent. Yes, the snow will be better in 1850 (it's 400m higher....) but Meribel has the advantage of easy access anywhere and almost failsafe return journeys. The last lift out of VT will still get you home even if you have to pole a bit. Neither of them have a massive amount for a non skier (although the window shopping in C1850 is definitely more upmarket) but there is a public swimming pool/ice rink/bowling alley in Meribel plus the hotels have spas and although neither are cheap, Meribel is cheaper. Aquamotion in Courchevel would be a plus for C1850 for the non-skier but it's not that far by taxi from Meribel via La Tania (and it's still a bus ride from C1850). Regarding snow, the Saulire Express from Meribel reaches the top of C1850 before the Courchevel lifts do so I wouldn't worry about that - you get first dibs on "their" snow if you have a 3V pass. Assuming your lads would also like to have a beer and listen to some music in the evening, Meribel has music every night - C1850 has nothing (C1650 does but again it's a bus ride). But the lads don't like the Folie (& high end Après). Who can blame them? @Ptspeak, There's a good called Le Rond Point in Meribel. Live bands for apres, young crowd, lovely burgers (prob lunch only), run by Brits. Not at all posh or pretentious. We were in the Alba Hotel over the road last year and frequently frequented. Thanks to everyone. Very helpful info. How difficult is it for a timid skier to ski down to Meribel Center? We have one beginner. Depends where from. The east side is easier than the west, particularly when it's still frozen in the morning. Both sides will have fairly heavy slush in the afternoon in March. If they're in the Altiport area (most likely for beginners) they can download from the Rhodos mid station to avoid it. If you go to the Ronnie (Rond Point) for apres, the bus stop is right outside so they can avoid it that way too. Mid station of the Saulire Express is also designed for getting pedestrians back from using the Folie Douce for apres. On the west side, download on Tougnete one. If you're trying to follow this on the piste map, bear in mind north is down, not up! Yes, pretty perfect, really Good hotel, good food, good location on the piste, ski hire downstairs, lively apres just over the road, stroll down the road to shops / restaurants - can't really fault it. Enjoy! @peter w, yes, good hotel, great location. Which operator runs it these days? Used to be Total/Esprit. We went there with Ski Toal last yr at Xmas. Think it reverted to Esprit the week after our stay. Alba location is great. We were there last year, but I think from this season they have dropped the kids element so it's just a straight hotel now. Basically you can book if there are no kids in your group where previously you couldn't. Food was ok. We had a few in our group get ill, although this was most likely because the place was full of toddlers... They were pretty hot at removing whatever wine was left on the table after dessert, rather than just leaving the bottle there as usually happens. It's all about the location really - best spot we've been in. Right next to the Ronnie and you are straight onto the slopes in the morning. The rental shop in the basement is good, and very convenient. Pizza place next door is also a good spot for the off nights. I think they are building a hotel right next to the roundabout, but I haven't seen any pics of that yet. We are off to Val Thorens on Sunday, for a week. No sign of any snowmaking activity on the webcams. 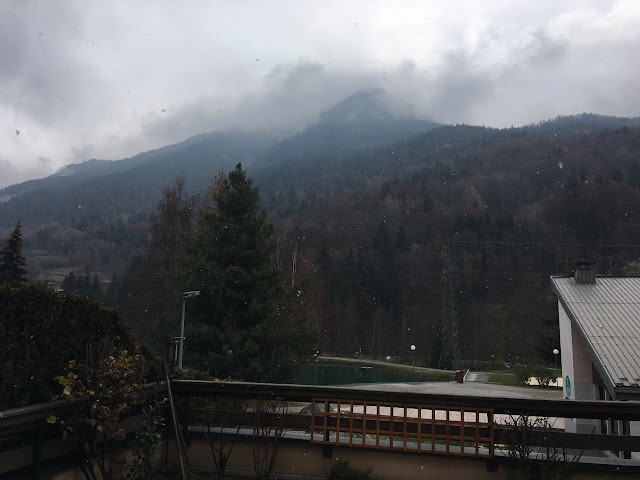 "Despite a desire to start the winter season on November 17th, the particularly anticyclonic weather does not allow us to open the resort and its ski area. The motivated teams of Val Thorens took the decision to focus on the Grand Premiere on November the 24th and 25th. Currently the snow cover at 2700m is satisfactory but does not allow a return to the resort on skis. All the teams are ready to prepare you the ski area as soon as the conditions are good. Packages and accommodation previously purchased for November the 17th can be refunded or postponed to the weekend of November 24th. We invite customers to contact directly their host or Val Thorens Reservation. - By private message on this page if you have any questions about your stay in Val Thorens for 17-18 November. - In the comments below if you have a general question." From the VT Facebook feed. @Bergmeister, Its roasting out here at the moment so I wouldn't get your hopes up..! Hopes dashed in view of jonathancarty's comment. We didn't expect epic conditions - but hadn't anticipated VT not opening at all in the week. 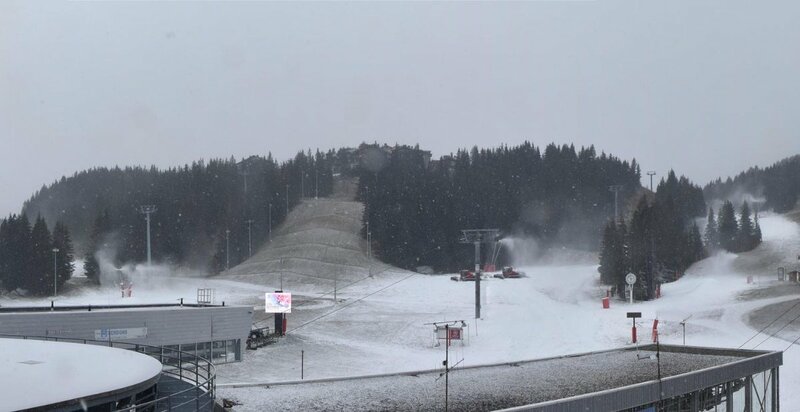 Snow Canons running in Courchevel right now. ...and bizarrely, given a dry forecast there are currently little flakes falling... nothing to get excited about but it is a better sign than the t-shirt weather last week! "Val Thorens will be opening on the 24th November for the Grande Premiere event. Despite the anticyclonic situation over the past few months, every team in the resort has done their uttermost to offer an opening as large as possible". "Taking into consideration the low levels of snowfall during the early season, the resort is planning to open 30% of the ski area (forecasted to increase over the coming days if weather permits). Only downhill skiing will be possible". "At the moment 10 snow groomers are actively working to compact the snow and prepare the snow cover to allow for skiing back to the centre of the resort at 2300m". Not very promising for VT opening this week. At least it's colder. The snow cannons are blasting in VT, and they are starting to make some real progress. Even without help from mother nature, I think they'll still be opening on the 24th with little problem. However, it looks like they'll get a few cm's of snow at resort level tomorrow, and potentially 10-15cm of snow on Friday night. ...so it’s very convenient. Just wondered if there might be better options available. We’ll be there at Easter, so I suppose most rental kit will have had a bit if a battering!